As I researched the meaning of my name, Hasselbacher, I thought I was pretty much on a roll. Just about everything was consistent with "hazelnuts by the brook!" 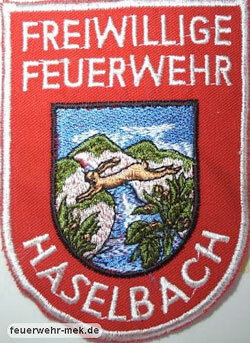 However, I was staggered somewhat and sent back 50 years to the perceived insults of my childhood when I stumbled upon the Wappen (insignea or coat of arms) of the Freiwillige Feuerwehr Haselbach (volunteer firefighters) of Haselbach displaying a rabbit jumping over a brook. As so often happens when I followup on such little puzzles, following the story is both instructive and fun. As it turns out, this seeming exception gives further support to the rule. I began a correspondence with two of the contacts on the firehouse webpage. The result has been both fun and informative. Herr Bernd Schubert provided me with a few photographs. This particular village of Haselbach lies in the former East Germany up next to the German- Czechoslovakian border between the larger German citys of Dresden and Chemniz. The nearest sizable town and postal district is Pfaffroda. Click on the map for more maps and photos. 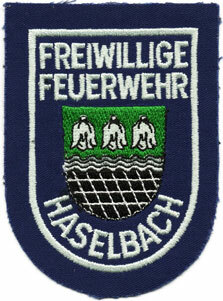 Like most places in Europe, Haselbach has a long history. Most communities in Germany, even small ones, have their own volunteer fire corps. There is even one In tiny Oberrossbach. As anywhere else, they like having a patch for their uniforms and there are people and websites that collect them. As it happens,the patch I found is not very old. The coat of arms, or Wappen, is quite modern, created by a local school principal around 1990. [See the left-most image on the panel just below.] I was told that the creator took some artistic license and that the rabbit has no known "official" association with the town. On the other hand, the stream named Haselbach with Hazelnut bushes along its upper reaches flows through the village named for it. 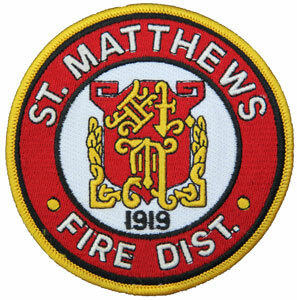 A closer look at higher resolution images of the firemen's patch clearly shows little nuts on the bushes. The villagers themselves assume that Haselbach refers to the usual pairing of nut and brook. 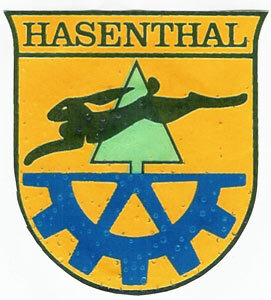 As I was looking for information, I found several other Wappen for Haselbach villages. I visited the one in Türingen [on right] last year and hope to visit my new friends in this current one. 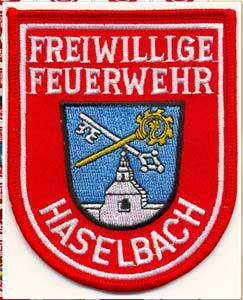 I do not yet know where the other Haselbach firemen live. Interestingly, I found another "jumping rabbit" Wappen for Hasenthal. 'Thal' is the old spelling for Tal, or valley. 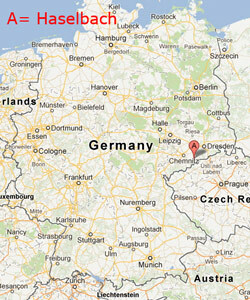 Somewhere in Germany there is a "Rabbit Valley": I do not yet know where! 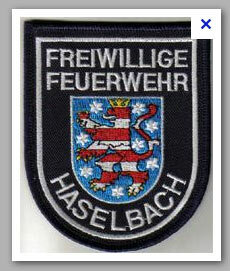 I traded a patch from my local firehouse in St.Matthews for one from the Hasen-Haselbach! In theory, any little Haselbach village like these might have given birth to Haselbacher families like mine. With two possible exceptions so far, all the Hasselbachers I have found for which I have enough information are related to me, or in one instance, assumed my family's name. The families from Dinkelsbühl, one of which immigrated to Oakland, California; and the Hasselebach family from Berndroth that immigrated to Sandusky, Ohio may be distinct lines of their own. I have high hopes that others of you out there will help us fill in the gaps. All are welcome on this website. Surely we have a special affinity! Return to "Meaning of Our Name"
Peter Hasselbacher, 20 May 2012. Contact me.